After the success of last two years, this year, too, Manick's artwork in multi-media as a part of the 7th Annual - 2008 Arvada Art Studio Tour, will be held at his studio at 14565 West 58th Place, Arvada, CO 80004, on September 20 and 21, 2008, 10 AM to 6 PM. The show is open to public. The visitors will get a glimpse of his contemporary art painted in digital media, news-art where portraits of news-makers are pieced together with relevant newspaper clippings, tile collages and tile paintings of Indian icons, portraits of Hindu Gods and .Goddesses with spices and grains, etc. For samples of some of his work in multi-media, click on Artist icon above. This year's special attraction - laser art. Manick Sorcar’s love with art and science started when he was very young, painting the back drops and doing lighting designs for his father’s world-touring, elaborate magic shows on stage. This eventually led him to become an electrical engineer specializing in lighting design and an artist. After coming to the USA, his interest in science and art flourished simultaneously. Today, by day, he is the full-time CEO/President of Sorcar Engineering, which did the architectural lighting designs for projects such as Denver International Airport concourses, Colorado Convention Center, sport centers in Japan, palaces in Saudi-Arabia etc. By night, he is an award-winning artist, cartoonist, animator and laserist. Manick enjoys doing artwork in multi-media in various forms - ranging from traditional waterpaint and acrylic paint, to tile-painting, tile-collage, news-art, spice-art, Styrofoam sculptures, digital art etc. His artwork has been showcased in many places including the University of Washington, Seattle, Sewell Ballroom at the Denver Center for Performing Arts, Jefferson County Library, Foothills Art Center in Golden, Colorado, etc. In 1996, his news-art “Mother Teresa” and “Wellington Webb” were selected as the "Art Show Pick” by The Denver Post, and in 2001 The Rocky Mountain News ran a two-page story with color pictures of his home that was designed by him, along with his artworks in it. In the same year, twenty-two patrons and the curator of the Asian Art Association of the Denver Art Museum visited Sorcar residence to admire his art. Manick is the animator and creator of several animation films, which won a host of top awards including the Gold-Plaque at Chicago International Film Festival, and Gold Medal at the International Film Festival of New York. Based on children’s fables from India, these animation films are regularly shown on PBS stations. In his recent works, he uniquely married art with science .to reate a number of laser animations and light sculptures that have been used on his stage shows. He is twice the winner of .ILDA Artistic Award from the International Laser Display Association. First, at Italy in 2006 for his “Enlightenment of Buddha” for .best use of lasers in a live performance, and the second, for best laser photography for his laser art “Reflection”; the trophy was handed to Manick on September 10, 2008 at the 2008 ILDA Annual Conference and Award Ceremony on board .the Carnival Imagination, cruising the Eastern Caribbean from September 8 to 13. At the Arvada Art Studio Tour of 2008, the visitors will get a glimpse of his art of universal theme in mixed-media. 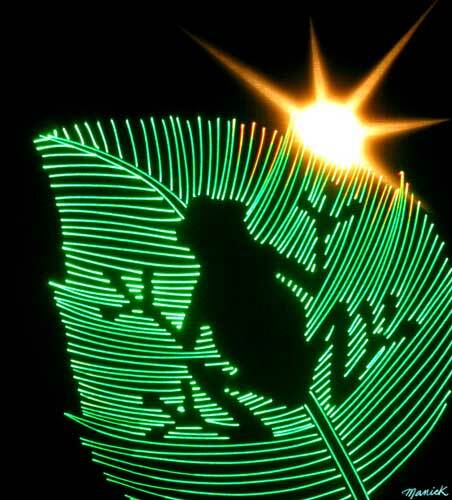 This year's special attraction - laser art.